See how a Devops user can use Predictive Insights and analytics to detect anomalies and help avoid application outages. Transform the way you run operations! Eliminate system outages with early warning proactive notifications, saving time and money. View this demo. Use IBM Performance Management and Log Analysis on IBM Cloud for your apps Monitoring and Analytics service. View the latest IBM Operations Analytics features, customer scenarios, integration demos and available resources. Take advantage of analytics for IBM middleware like IBM MQ, WebSphere Application Server, and IBM Integration Bus. Extend "search" capabilities to analyze incidents and service requests for assigning tickets to subject matter experts. Expand coverage in your IT infrastructure environment by taking advantage of ready to use integrations and extensions. Log Analysis can give you the insight you need to rapidly resolve application, infrastructure, and networking issues. 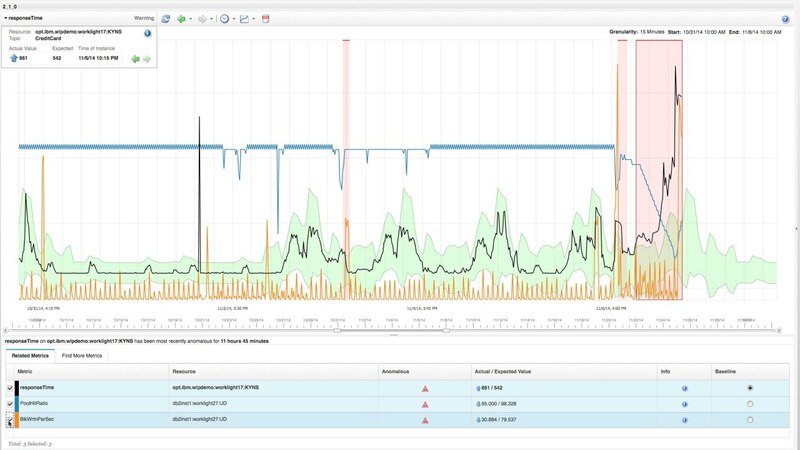 Predictive Insights helps you prevent application degradation and service outages. Learn how to get the best out of IBM Operations Analytics to fully optimize solutions in your IT Infrastructure. Check out our community blogs for the latest ideas, hints and tips on implementing IBM Operations Analytics. Read insights on the IT infrastructure Service Management and Operations Analytics breakthroughs.